Ideal for relaxation, cycling or walking & site seeing in a beautiful valley. New for 2016 - French bread & coissantes to order every morning. Self-contained comfortable cottage of charm & character. Large fully fitted kitchen/dining room/lounge decorated with original paintings. Full central heating. Sky free to view & French TV installed. The stone walls ensure warmth in winter & keeps you cool in summer. Breakfast on the shady terrace or balcony. There is a full size gas hob, electric oven, large fridge, washing machine & the kitchen is fully equipped. Upstairs there is a door to the balcony, two bedrooms (one double & one with double & single bed) A large shower room with cubicle shower & vanity unit. Separate WC. There are also outside stairs to the balcony. Linen & towels provided, changed weekly. Welcome pack - milk, tea, coffee, sugar, toilet rolls & a bottle of wine. Dinner may be ordered if desired. at 24hrs notice. Off road parking. Cycle hire. We regret that our property is not suitable for children under 5 or the infirm due to the WC being on the first floor. Exclusive use of Outdoor Pool in garden - open July - mid Sept only. Ideal Centre for Site Seeing : Midway between to Limoux, & Mirepoix, south of Carcassonne, this is an ideal centre for visiting the Cathar Castles. A wonderfully scenic drive takes you through Chalabre, Puivert, Quillan and on through the dramatic Gorges de St George past Puilaurens & on towards the Spanish border to Queribus & Perpetuise. On the way you will pass some remarkable scenery & hundreds of opportunities to taste the local wines!! The local cooperative shop will welcome you to taste their wares & buy a bottle or two to take home for dinner! Or turn to the west & visit Ch. Monsegur the last stronghold of the Cathars & the magnificent Pyrenees themselves. Visit neolithic caves, ride a scenic railway or take a boat on an underground lake. Feeling more adventurous - white water rafting, caving, climbing or walking are popular sports. Fantastic cycling on safe roads or mountain biking. Limoux is host to the start of a stage of the Tour de France again this year, the town outdid itself with fantastic flower displays all themed to the cycling. Strolling through the town on the Saturday evening last year was a hugely interesting experience even for those who are not cycling fans. The start on Sunday was amazing in its efficient execution but at the same time giving the many fans who came for the occasion plenty of opportunity for a very close look at the most famous cyclists in the world. Limoux also prides itself on being one of the most floriferous towns in France, changing the planted displays in baskets, planters, on roundabouts & down the sides of the streets & roads four times a year. Having an aperatif in the attractive main square or even a meal under the brollies at one of the many restaurants in the warm evening sunshine is a very pleasant holiday experience. Mirepoix is a medieval town with an ancient arcaded market square, many restaurants & outdoor cafes, with a unique parish church of international historical importance. The town prides itself on the regular musical & theatrical performances in the square, especially the jazz festival in July. The regular Monday market attracts visitors from all over the world with everything from the freshest of vegetables to exotic clothing. Wine Country - Reds, whites & sparkling: Butterfly Cottage lies within 15 min. of the centre of production of the famed champagne type wine Blanquette de Limoux. Tasting sessions are available at many outlets in the town. Also in easy reach is the Cotes de Malpere & Carcasses full bodied wines of excellent flavour. Then towards the Med Coast is the Corbieres, Fitou, Quatourze & Rivesaltes appellations; well known wines exported widely and much loved by wine lovers all over the world. Travelling north, yet still within an hours drive lie the Cabardes, Montagne Noir, Minervois, Narbonnais & La Clape appellations - again exported widely and much enjoyed. The majority of the individual vineyards run tasting sessions by appointment, although it is possible to drop in to taste & buy at all the cooperative shops for each wine area. A wonderful day out is a drive through the Gorges de St George down to Rivesaltes wine tasting at the Cooperative in Maury followed by lunch in the garden at the restaurant opposite, I can recommend it! Mike and I have been together many years having run a successful agricultural advisory business in the North of England together for 18 years before we moved to live in France. I have always ridden & driven horses as my sport & Mike has been a successful amateur racing cyclist all his life. I am an enthusiastic cook, gardener and a fairly successful artist - watercolours & oils. I love painting portraits. I am also a Reiki Seichem Master/Teacher & enjoy all levels of a spiritual life connected to the land & our beloved woodland. We also have a farm with breeding sheep here at Gary, but as we are surrounded by mature broadleafed woodland we also have an interest in a firewood business. Our forester comes from Cumbria & manages our woodland in an ecologically sound & sympathetic manner. Mike is a keen gatherer of wild mushrooms in season & is also a keen gardener. He loves introducing children & young people to the country life having reared two lovely daughters of his own. He keeps good care of our cycles & his own beloved Kuota! which he rides regularly. I enjoy cycling too but am not up to his level of fitness & dont do hills very well. He will happily take cycling parties out for a spin if required. We both enjoy our animals, we have 3 cats and a dog as well as my retired horses and of course our small flock of sheep. It gives us both great pleasure to see our visitors relax & enjoy both our cottage and the beautiful area in which we live. Well, we didnt really set out to buy a property, it just happened. We were in the area on holiday & tagged on to a property visiting event with our sister in law. Basically we came to Gary, saw the house & land & just decided to buy it. It was so like our home in the UK, lost in the forest with a few paddocks, only here at Gary we have much more land & we actually own the woodland too. The old stone house needed a lot of love & care but had a huge amount of potential which we have been able to exploit. We havnt been able to date the house as there have been no records kept but we think it is about 300 years old. The walls are thick & keep us cool in summer but warm in winter. We have a large vegetable garden sloping east-south/east on clay but which is now starting to produce well after several seasons of deep working & applications of well rotted manure. The surrounding woodland is full of wildlife & we have many rare butterflies & orchids. We also have wild strawberries in the spring & wild crocus in the autumn. Sweet chestnuts are plentiful along with walnuts, medlar & blackberries. Many of the annual traditional garden flowers which I have planted since we arrived seem to have started to naturalise & I have also noticed several types of garden flowers which grow wild in this area - we even have alliums growing in the hedgerows. Many of our visitors ask us how we found the property & our answer can only be Chance - either that or in some unique way the property found us. I think that under this heading I can only say that although when you live or stay here at Gary you can feel as though you are in the depths of the countryside, when in actual fact we are only a few miles from our nearest village and only a few miles further from a decent sized town and wonderful site seeing in a unique historial area. We now supply fresh bread & croissantes to order each day. On the other hand, we enjoy the annual visit of the Tour de France - it always seems to come close to us and in fact for the last 2 years our local town Limoux has been able to host a stage start. Add to that we have quiet roads all the year round so it is possible to enjoy a safe & peaceful cycle ride whenever you wish - at all levels of difficulty from virtually flat to as steep as you can manage. It is also easy to visit many of the great Pyrennean climbs to have a go yourself if you fancy it & still get home to supper. The Med is not too far away for a day trip so safe, warm sea bathing is a regular enjoyment, or walking in the mountains - we are extremely lucky to be virtually central to a wide array of sports & activities. Then of course I mustnt forget the old castles & abbeys - we especially enjoy the music concerts & other activities which are held throughout the year at many of these venues. Our closest castle, Chateau Chalabre has its own horses & knights & holds weekly tournaments & participation entertainments specially geared to children all summer & it is only about 5 miles away over the hill. It is safe to say there is always something interesting to do if you want to apart from sitting in the garden by the pool in the sun. One of our visitors was delighted to sit & see the stars in the night sky after a lifetime of light pollution! Most people find something unique about Gary. The bathroom is provided with high quality bath and hand towels for each member of your party. A new double shower cubicle has been installed recently it is fully glazed and has a wooden duck board. Tiled & decorated in pale lilac with an antique Lloyd Loom style chair. Swimming towels are also provided. Including for swimming or beach use. Stainless steel equipment featured, slow cooker, etc. English style lawns and garden with flowers & trees. Large tiled balcony on lst floor with table, chairs & sun umberella with a smaller shaded terrace below. Wooden deck with table & chairs - catches the morning & evening sunshire - ideal for breakfast or dinner!! Solar panel heating - average temperature of water July/August 2015 30 degrees C!! Our property is not suitable for children under 5 years of age. It is possible to play Petanq or bowls in the courtyard and for children to play safely without fear. There is no through traffic as the hamlet is at the end of a 3km lane. You can walk in our woods or have a picnic in the meadow. At whatever season of the year you visit us you will find the woods and fields both inspiring & beautiful. In addition, Gilli, as well as a gifted cook, is also a Master Reiki Seichem healer and will be pleased to take a booking for sessions at your convenience. We have a thriving bio potager & will provide produce in season depending on availability. We breed sheep & have cats & a dog . We provide a welcome pack and will do a shopping list on request. Guided walking or cycling available at an extra charge & bike hire available, book in advance giving details of requirements. Fancy a mushroom foray, Mike takes bookings in autumn only or buy dried mushrooms from us throughout the year. Utterly idyllic spot with generous hosts. Absolutely wonderful stay at Butterfly Cottage, which is as quiet and relaxing as we could possibly have hoped for. The cottage itself caters amply for a family of 4 (great shower!) and sitting on the outside terrace you could quite literally be in the middle of nowhere amid the stunning scenery. The only sounds at night are those of the forest and wildlife abounds - the cottage is aptly named - we have not felt so relaxed in years. What made the stay extra special was Gilli and Mike. Their generosity (wonderful garden produce) and advice on where to go was fabulous. On discovering I had a particular interest in moths, Gilli told me about the hatching Death's Head Hawk moths they had seen and over the week they brought round two recently emerged moths for the children and I to see before releasing them - quite wonderful! The cottage is ideally situated for exploring markets, Cathar Castles, beaches, Carcassonne and of course wine. We would return in a heartbeat. Thank you Gilli and Mike for a wonderful stay! Thank you for your very kind review. As we explained Mike has always had this passion for moths & butterflies so it was wonderful to share our exceptional creatures with you all. Late August & early September seem to be the weeks for the hatching of these amazing Deaths Head Hawk moths. We really love this place and its surroundings and we thoroughly enjoy sharing it with like minded people. We hope you will come back to visit us again. Fabulous setting for a relaxing break. Butterfly Cottage more than lived up to the description provided. The cottage was clean and comfortable but more importantly felt homely. Given that it was a considerable drive to the local shops we were delighted to find that the essentials such as coffee and milk were provided for the first night. 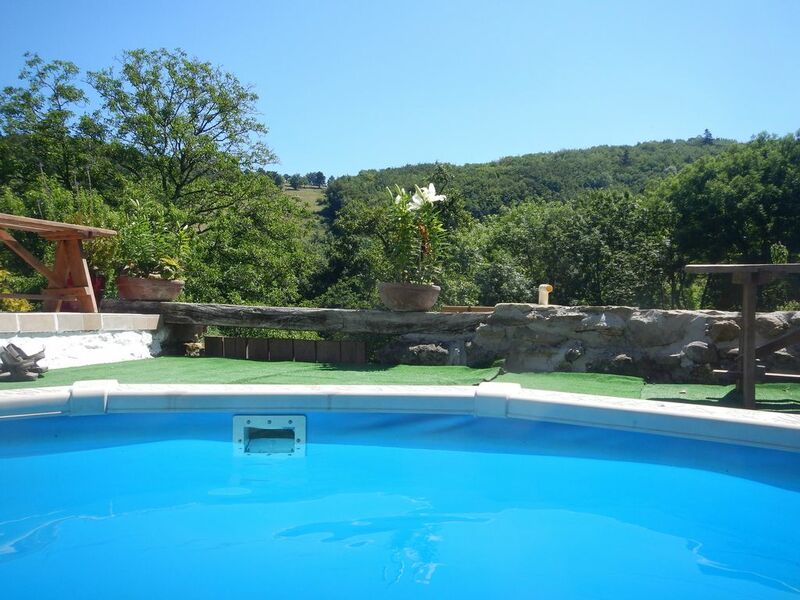 The setting is stunning if you are looking for relaxation and beautiful French countryside with attractions within driving distance should you wish to explore the area. The cottage had a comprehensive folder containing local information and attractions. The pool which was exceptionally clean was an added bonus for my granddaughter who made good use of the facility. The owners, Gilli and Mike, were really friendly and on hand should you need advice, information or directions. Prior to our holiday we had arranged for Gilli to provide us with a meal on our first evening. Gilli is an accomplished cook and the meal was superb. So much so, we arranged another meal for later in the week! A treat not to be missed! Mike also sent us home with a bag of dried mushrooms which he had "foraged" during our stay. Tomorrow night my kitchen will be full of the smell of mushrooms and memories of our recent holiday as I cook up a wild mushroom risotto. We would certainly stay at Butterfly Cottage again and recommend it to others who enjoy nature and the countryside. Very glad that you enjoyed your visit and will look forward to you coming to see us again. We love our home here at Gary & sharing it with our visitors gives us a lot of pleasure. As we drove down the country lane passing pigs, horses, fields and through woods we wondered where on earth we were going amd if we would ever get there! And then we pulled into yard and were greeted by Gilli, Mike and lovely bouncy bella the staffordshire bull terrier in the beautiful tiny hamlet of Gary. Butterfly Cottage has everything you need and we enjoyed many hours in the garden, playing in the pool and walking through the countryside. Carcassonne is stunning and around 40 minutes drive away and there are many pretty villages nearby with markets to wander and explore. Gilli and Mike are on hand to provide any information and advice and provided us with gifts of fresh produce from there garden which was delicious. This really is a little bubble of peace and tranquility and we were sad to leave. We would highly recommend this property. When looking for a French cottage holiday it can be a little hit and miss, we've been to a few misses over the years but the reviews for Butterfly cottage were so good we had to give it a try, well what can I say? the reviews are spot on, from the long leafy drive into Gary and the warm welcome you receive from Gilli and Mike you know you're on to a winner. Butterfly cottage is everything we'd hoped for and more! My wife and daughters wanted warm weather markets and a pool to relax in and i wanted history, castles and dare i say wine! all were provided in the area and property. Butterfly cottage is well appointed, nestled at the end of a wooded lane surrounded by forest and open fields, all of which you can explore if you've a mind, if you like good food Gilli will provide you with a meal on arrival or anytime you don't feel like cooking for a very reasonable price including wine....she is a very good cook and uses all her own produce which was delicious and just about as fresh as you'll ever have. Inside Butterfly Cottage upstairs you have two double rooms one of which also has a single bed so lots of room, seperate wc and the most amazing shower room, from the landing you can go outside onto a roomy balcony where I sat every morning with my coffee listening to the sounds of forest and wildlife...bliss? you betcha! Downstairs you have a kitchen and living room, kitchen is fully fitted with fridge freezer, microwave, slow cooker (very handy after a long day out) oven and hob, there is no dishwasher but I don't have one at home so didn't miss it, there is a dining table and chairs if it gets too hot to eat outside and sofas with stereo and English and French tv channels. Outside the ground floor door is a very nice raised eating area with table chairs and a candle holder for lighting once the suns gone down. As i've said before i've been to one or two properties over the years but never enjoyed my surroundings as much as I did here. Towels, beach/pool and bedding are all provided so don't lug extra weight and there's plenty of spares, there was even spare toiletries which we didn't need but if you'd forgotten them they were there for your use. Gilli and Mike are truly the best owners ever! they are helpful in every way from gifts of fresh fruit and veg from the garden or tips and advice on places to visit. A friendly welcome by the landowners in a small farm. Quietness guarenteed and beautyfull walks trough the surrouding forest. Excellent for nature and hiking lovers, I've spent three relaxing days sharing my time between following the farms' work and wandering in the forest arround. Thank to Gilli and Mike for this good time shared. Thank you for your review. The weather was kind and we enjoyed your company, a short break can be very relaxing I am surprised more people dont try it especially as Carcassonne airport is so close. Gary is a small hamlet of houses set in a valley of deciduous woods and grazing pastures. Close to the GN7 walking route there is unlimited walking and cycling (road & all terrain) Hire your cycle from us - good quality road & all terrain, straight from our door. Listen to the nightingales sing in spring or the deer barking and owls hooting in late summer from our sunny balcony or shady terrace. Our gardens & the wild flowers attract fantastic butterflies, Swallowtails, Rare Swallowtail, Silver Washed Frits, White Admirals & many more. Relax in the sunshine, swim in the pool, picnic in the woods, walk marked paths or further afield. Close to Carcassonne & the Cathar Castles. Like a wild swim? visit Montbel a large lake near Chalabre with a mountain backdrop, or the lake at the foot of Puivert Castle. On the edge of this wonderful wine growing areas, taste Blanquette de Limoux, or the reds & whites of Malpere, Corbiere, Minervois, tasting visits can be arrange. Go with Mike on a Fungus Foray Aug to Oct - cooking tips with Gilli. We advise visitors to buy holiday insurance as we DO NOT make refunds once the full payment has been made. Payment for additional services such as evening meal on arrival may be paid when you arrive, please see our further information for bike hire etc.